Looking for an app that can reliably convert any media files on Mac OS X? 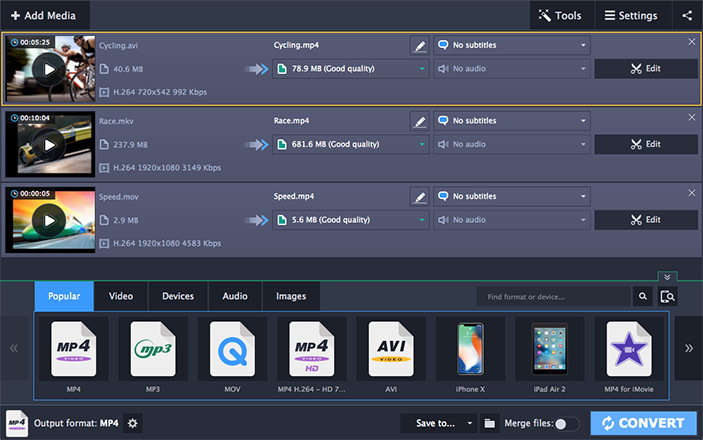 Movavi Video Converter for Mac is one of the fastest and most error-free ways to export your video, photo, and audio files to any desired format. Download this bestselling conversion software and experience your multimedia collections without format limitations! Spice up your videos with our brand new effects – apply color filters, fill in black areas in vertical videos, do away with the fisheye effect, and more. Drag and drop the media files into the program working area on your Mac. Select the output format for your files. Hit the Convert button to launch the process. Your files will be ready in no time! Your device doesn’t support a particular file format? 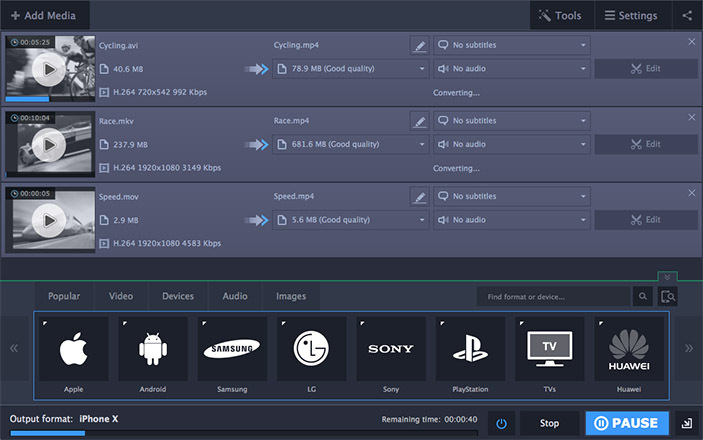 Our encoder can help you easily turn any file into a format that’s supported by your smartphone, tablet, TV, or other playback device. Can’t find a simple media converter for Mac? Movavi gives you just what you need – an app with a self-explanatory interface that’s easy to navigate. Want to shrink the size of your multimedia files? 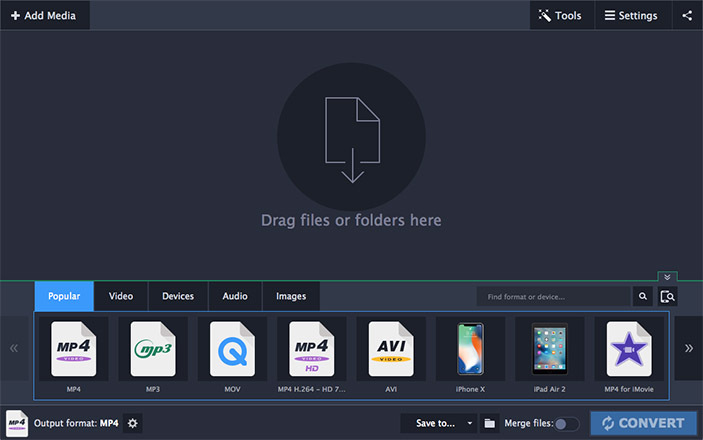 Use the Movavi video compressor for Mac to reduce the size of your files so you can fit more of them on your iPad, copy them to a USB stick, or upload them online. Get even better results with our VBR presets. The audio in your recordings is too low? You can set the desired sound levels in your videos using the converter editing features. Planning to save videos in the best ratio of size to quality? If you don’t want to compromise the video quality while reducing the size of your videos, our program can help you out! Need to rotate or stabilize your footage or add a watermark? 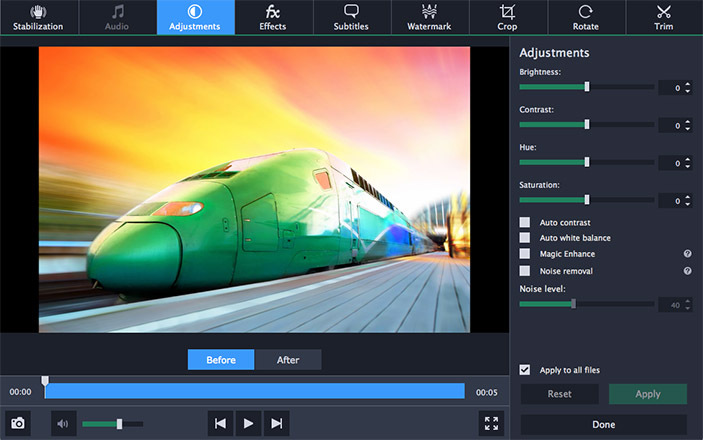 Get the software to try the advanced editing options – rotate or trim without conversion, stabilize footage, insert watermarks and titles, improve quality, and more. Wondering how to transfer clips from different sources to a single format? With the application, you can convert recordings from different cameras and phones to a single format. Now all your vacation and holiday videos are within an arm’s reach! Need a simple conversion app that lets you access any popular file format? 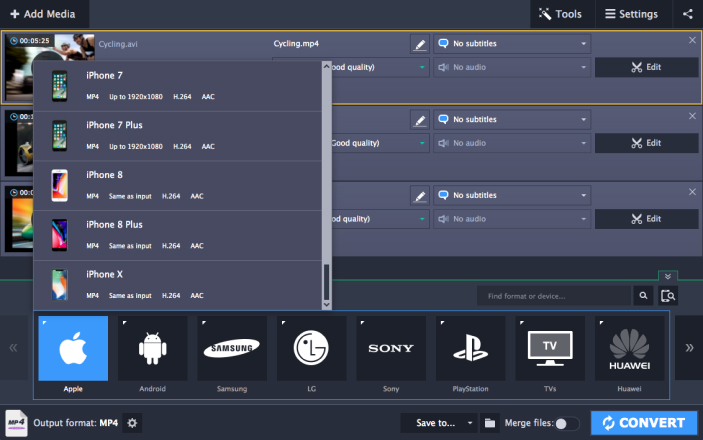 This powerful software by Movavi can be used not only as a tool for processing videos, but also as an audio converter for your Mac, a video-to-audio encoder, and a photo converter. Try the program now and unleash the full potential of your Mac! Disclaimer. Please be aware that Movavi Video Converter for Mac does not allow you to convert copy-protected media files and DVDs.